There is an argument that we all need to learn less if we want to know more. The ‘learning’ referred to here is what we know as formal structured learning activities - classes, courses, programmes, and eLearning. Although formal learning only constitutes about 10-20% of the actual learning that occurs in organisations, it’s the visible part of the iceberg and the part where most of the budget and L&D resource is focused. When we look at the structured learning taking place in organisations we find that the vast majority is content-rich and interaction-poor. The further up the hierarchy we go – from K12 to college through University and into training and learning in our working lives – we notice the majority of the structured learning we’re offered contains lots of content for us to ‘know’ but very little opportunity for us build capability to ‘do’. Yet action and ‘doing’ are at the heart of the value that people bring to themselves, to their work and to their organisations. Knowledge may provide scaffolding, but we’ve learned over the past 30 years or so that most of the knowledge we need to ‘do’ doesn’t have to be stored in our heads. There’s research that proves this point, but we only have to think about a common scenario to realise it ourselves. Consider this. Your organisation has just rolled out a new online Finance system that requires you to use a new set of processes and forms when you complete your monthly expense claims. The new expense process that you need to follow has a number of steps, some of which are counter-intuitive (I’m sure we’ve all been faced with systems like this). Prior to system roll-out you’re required to attend a 2-hour instructor-led briefing/course along with all your colleagues. The instructor leads you through all six new processes that you’ll need to follow and describes the steps you’ll need to take in each. The expenses process had 12 steps. Some of the other five processes in the new system (raising and signing-off purchase orders, receiving goods etc.) have more steps, some have less. The course is content-rich. You are shown screen-shots of the new system and the instructor steps through each process (without giving participants the opportunity to practice on the system itself as go-live day is still in the future and the system isn’t yet stable). At the end of the course the instructor hands out a bound folder with all the screen-shots and descriptions of the processes. a. Recall the processes you had been taught and easily step through them? b. Find the folder and step through the processes from the screen-shots and descriptions? c. Ask a colleague if they have used the system, if they have, get their help? The chance is that you do either c. or d.
There are a couple of reasons. Firstly, very few people would be able to recall task detail weeks after being instructed. Even if you were tested and proved that you had ‘learned’ the processes at the end of the training. 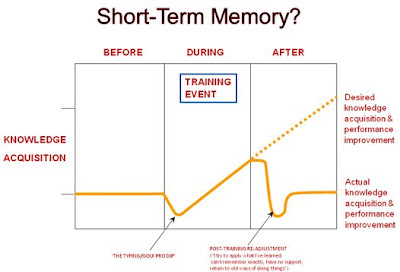 Post-training tests demonstrate short-term memory recall, not behaviour-changing learning. Hermann Ebbinghaus illustrated this and the exponential nature of forgetting in his famous 1885 experiment. In short, we forget around 40% of non-contextual information within the first 20 minutes of learning it if we don’t practice and reinforce the learning almost immediately. If you didn’t have the opportunity to practice the new Finance system processes, they were mostly gone from memory the next day. If you did, then didn’t have the opportunity to use the system again for a number of weeks, you’ve lost it from short-term memory again. The second reason people ask others or call the helpline is because the vast majority of people simply don’t turn to detailed manuals when facing a problem and can’t remember the solution. They are more likely to turn to other people for help. Even if you pulled the folder off the shelf it’s likely that the amount of detail and the number of processes would have made it difficult to follow, and you will have lost the context with which they were described in the course anyway. Part of the problem is that with learning we tend to concentrate too much on content and ‘knowing’ and too little on action and ‘doing’. The standard approach has been to expect people to learn all the content in a structured learning event – whether it’s an ILT or eLearning module, course or programme. Then ratify this learning through some type of assessment. The assumption is that if you pass the assessment, you’ve ‘learned the topic’. This is a naïve view of the learning process. Learning is about behaviour change, not short-term knowledge acquisition. Most people who sit down to design learning experiences (even trained ‘instructional designers’) think first about the content. ‘How much content can I transmit to the recipients in the time I’ve allowed?’ or ‘Which content do I need to produce to meet the learning objectives?’ The knee-jerk reaction is to start with the content because somehow we seem to think that learning revolves around content. Content is information which we believe somehow transmogrifies into knowledge that will be useful to ‘do’ at some time in the future. If we break what we need to know about using a process or procedure, for example, into its component parts we can start to get an understanding of what we need to learn and commit to long-term memory and what we don’t. Firstly, there are some things that we simply have to commit to memory. These are the core concepts. In the diagram above the examples of core concepts are things such as ‘what does my job involve?’ and ‘what relationship does my role have with other departments?’ This is what I’d call the DNA of the role. Other core concepts that need to be committed to memory may involve some basic formulae, tools, marketplace practices and ‘the way we do things around here’. This is the content that any good new hire or induction training programme should include. These core concepts only change rarely. Structured learning/training works well to help with this memorisation. Then there are things that we need to be familiar with, but don’t need to commit to memory in any detail. These are contextual elements that may vary depending on the context in which we need to use them. The Finance system processes are good examples of this. They are probably too complex to be learned correctly, and they are likely to change over time or depending on the role of the person using them. There’s no point committing the detail to memory, but it’s helpful to be familiar with the general structure and steps. Finally there is the detailed task-specific content. The 12 steps in the process map and the field-level forms in the case of the Finance process. This is ‘stuff’ that you simply shouldn’t waste time learning, or trying to learn in a formal way. In many situations, task-specific content changes constantly. What was correct and up-to-date last week may not be correct and up-to-date today. It is simply a waste of time to include this content in structured learning/training courses and programmes. You may learn it by repeatedly doing it, and then you have the problem of ‘unlearning’ it when the process changes. The answer is that in today’s rapidly changing world we need to learn just enough to be prepared to meet that rapid change. This means, in the words of John Seely Brown, we need to rethink what we need to learn, and how we learn. If most of what we learn is going to be rapidly made obsolete by change, then we need to change our learning models. This brings us back to the initial premise – if we want to know more, then maybe we should learn less. The Find/Access model addresses this challenge. This model takes a lot of the content out of 'learning' and moves it into the ‘familiarise’ and ‘find’ categories. The Find/Access model focuses learning only on core concepts. Basic conceptual tools such as critical thinking skills, analytics skills, logic, search skills, data validation skills, research methodologies skills and so on fall into the core concepts bucket. This is the ‘stuff’ we need to learn. Armed with the skills developed in the core concepts bucket, dynamic and detailed content can be obtained when it’s needed from ‘the cloud’ or from other sources – m colleagues, helpdesks, experts and so on. There’s no need to incorporate the vast majority of the dynamic content we need in structured learning courses and events. In fact, doing so simply distracts and consumes time – which may be a benefit to the providers of learning courses and events, but is of little use in the process of improving performance. However, we should be careful not to throw the baby out with the bathwater. To take this step we first need to ensure we have both the core find skills – the ‘MindFind’ skills (as my co-authors David James Clarke IV, Cameron Crowe and I describe in our forthcoming book MindFind) – and the tools to connect us to the information sources we need at the time we need them. Fortunately, Web application developments over the past 3-4 years are making this second task much easier for us. As professionals involved in learning and performance improvement, we need to focus on helping others develop capabilities and skills in the core concepts bucket – the critical thinking skills, the analytical skills, logic, the search skills, and to develop some understanding of research methodologies. Fortunately, the development of third order approaches to the organisation, categorisation and labelling of information allows us to find what we need much more easily now than in the past. This is critical, and the designers of every structured course should reinforce the development of third order find skills and the use of third order find approaches. David Weinberger explains these third order approaches very clearly in his excellent book ‘Everything is Miscellaneous: the power of the new digital disorder’. Weinberger describes how tagging and metadata (third order classification) allow us to find information from our own contextual standpoint, rather than having to fit into some classifier’s context. Those of us who spent weeks and months shuffling academic library index cards in the past will understand how liberating the use of metadata has been. As we develop these third order find skills the misplaced need for vast amounts of content in structured learning will fall away. We’ll need less structured learning overall. We’ll place more focus on learning by doing (through experience and practice), through interacting with others (network-building and conversations) and through reflecting on our actions. As a result, although we’ll be learning more overall, our structured learning will decrease. We’ll know more and the knowledge we need will be more relevant for action. Trust is very important in our lives. As children we put our trust in our parents. As we grew we learned to make decisions regarding when we should trust and when we should be more circumspect. When we start a new job or project we spend time figuring out who we can turn to for advice, who we can trust, and whose advice we need to double-check. With the rise of the networked society and the increasing use of social networking tools, trust is probably on our minds every day. Who doesn’t hesitate before clicking on that shortened URL from a friend on Facebook or someone we follow on Twitter and wonder whether it’s genuine or whether the account has been hijacked and the link is about to initiate some malware infection from an unknown server in some unknown location that just may not be caught by our spam/malware protection software? 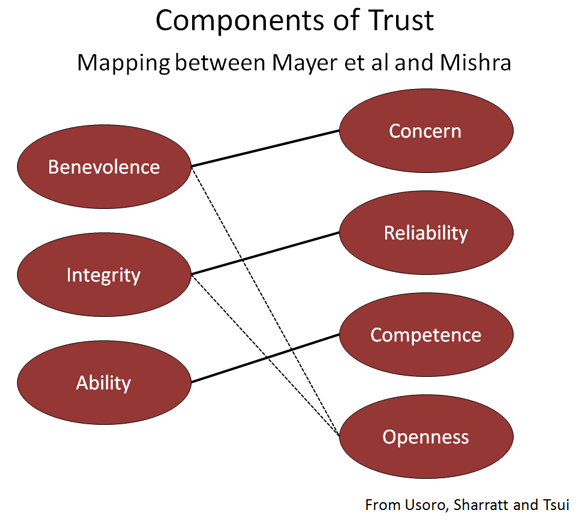 So, trust is probably at the forefront of our thinking most days. 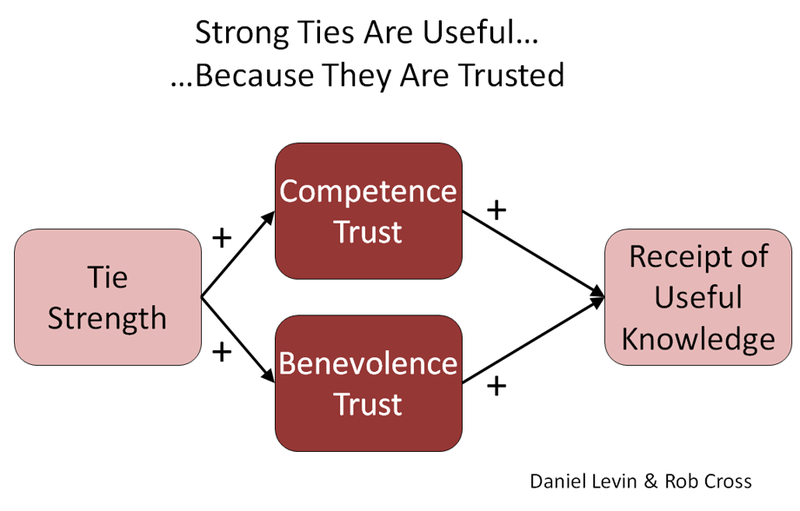 Trust relationships are powerful allies in getting things done in organisations. I think we're all aware of that. If we’re working in L&D strong trust relationships with senior leaders and middle managers are vital. Without a high level of trust anyL&D manager will find it almost impossible to embed a culture of learning in their organisation. Like HR, many training and learning departments have been trying for years to gain a seat at the top table in their organisation. To a large extent these attempts have failed and it’s worth asking why this is the case. Although the age-old management credo that ‘our people are our greatest asset’ has now moved beyond lip-service in many organisations (despite the fact that the value of this ‘greatest asset’ still isn’t explicitly shown on a balance sheet), the leadership of the part of the organisation that’s directly responsible for working, advising and helping extract maximum performance from this asset is still not welcome as an equal member of the senior management team. Sure, CLOs and senior L&D managers may regularly be invited to present new initiatives or ‘state of play’ reports to senior management meetings, but that’s different from being inside the tent or having a ‘seat at the table’ and contributing to ongoing strategy development. This situation raises a couple of questions for me - and they're both tied to trust and trust relationships. The first question is: “Do most senior managers actually believe that L&D managers play an important role in keeping the organisation running and on-track’’? Associated with this is a second question: “Do most managers think that L&D can add value”? I think both of these questions come back to competence trust and to relevance. They beg the question as to whether business managers have confidence that their L&D department can make a difference, impact organisational performance and the balance sheet. In other words, is L&D relevant in business terms? If it isn’t, then why include passengers on the senior leadership team. So, what can CLOs and L&D managers do to address this? Firstly it’s worth understanding about the some of the different types of trust and then developing a plan to build trust with your senior business colleagues. Trust is qualified in a number of ways. 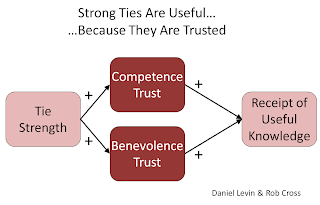 For some there are two types - competence trust and benevolent trust. The difference is this. The first is the ‘I believe you know what you’re talking about, so I’ll trust your opinion’ type of trust. In other words,’ I believe that you’re competent so I’ll trust you’. The second is the ‘I believe that you won’t tell me anything that will harm me, so I’ll trust your opinion’ type of trust. Another view of how we come to trust someone or not is defined as being based on our assessment of their benevolence, integrity and ability. If you want to move L&D up the agenda and have the opportunity to be involved in strategic decision-making, you need to demonstrate that the L&D managers and their teams are trustworthy. You do this by building trust relationships. By demonstrating that you understand the problems business managers are facing, and then by working with them to deliver solutions to resolve those problems demonstrably, quickly, efficiently. 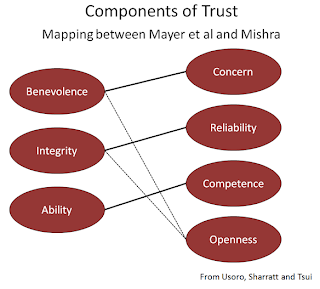 By doing this you will start to build competence trust and benevolent trust relationships. You’ll also go a long way towards engendering your managers’ trust in your ability and competence to deliver business solutions, and a feeling that you are a trusted partner, someone who can be relied on. If you work on this basis – get close to your business managers, analyse their problems with them, advise them of the options open to them from your professional L&D standpoint, take their input, and then develop effective solutions, and demonstrate the efficacy and impact in the most straightforward way possible – in business terms – you will find that a trust relationship will develop. That’s the way to get a seat at the top table. It’s not magic. You’ll just find yourself being invited to provide advice and suggestions at early stages in the strategy-setting process. You’ll find people calling you up because the CEO or CFO has recommended you as someone who can help managers with their problems. You may even find HR colleagues asking how you have managed to become a trusted consultant and advisor to the CEO and CFO and other senior leaders. These turbulent economic times have not been kind to two of the large publishers of catalogues and journals - Reader's Digest and Learning Tree International. Of course, Learning Tree International's business is selling face-to-face courses, but most of us will have had the Learning Tree catalogue 'brick' of courses dropping onto our desks on a regular basis for many years. Learning Tree has been around since 1974. Readers Digest is much older, having first rolled off the presses in 1922. However, both are living in troubled times for the same reason – a failure to innovate and a failure to adapt in a rapidly changing world. Reader's Digest still circulates to 17 million people in 65 countries worldwide, but major problems with its financial structuring and an ongoing drop in readership (down from 18 million in the USA in the 1970s to 8 million today – still the largest audited circulation of any magazine) has left it in dire straits. The US company is preparing to file a pre-arranged bankruptcy agreement, to trim back to a distribution of 5.5 million, and reduce editions from 12 to 10 a year. However word on the streets is that it has 'lost its way' and will never recover but will slowly wither and die. One view is that Reader's Digest has lost its 'DNA'. When Lila Bell and De Witt Wallace conceived their baby in Minnesota back in the 1920s there were no competitors to the condensed articles, the 'Use Your Word Power' quizzes and the jokes that they made available through the Digest. Despite moving some activity onto the Internet and getting its journalists blogging the company is still struggling. Current blog postings include '4 tips for selling your gold' and 'it's enough to make your stomach hurt' – with more tips, this time for avoiding heartburn. So it's no surprise really. It seems that Reader's Digest hasn't come to terms with the way that people get their information, and their laughs, these days. Learning Tree International recently published its F3Q09 earnings. They don't make pretty reading to me (despite at least one analyst upgrading LTRE to 'buy' – but analysts don't have a great track record for picking fundamental weaknesses in business models - just think back to the late-1990s first Internet bubble burst or to the more recent failure to see the business model weaknesses in the sub-prime fiasco). Learning Tree reported a decline of 31.2% in earnings compared to 2008. Operating expenses were down from $22 million to $14.6 million ($1.5 million of that contributed by producing less of those damn catalogues). And overall operating profit was down by 40.7% compared to the same period in 2008. Net income was down 44.7%. Maybe more interesting is Learning Tree's decline in learner activity (I use the term 'learner' advisedly in this context as the structure of many Learning Tree courses is such that many people only learn despite the Learning Tree course - more of that later). There was a 20.7% decrease in attendance overall, with management courses down by 13.7% and IT attendee days down by 31.7%. The CEO reported that foreign exchange rate changes had an impact, but I think Learning Tree is facing deeper problems. And they're the same problems being faced by Reader's Digest. Old business models cannot be maintained forever. The world is moving on, people expect to get their learning and development online where possible, at a time that suits them, and in small chunks rather than 5-day off-the-job courses. This change in user demand has been taking place for at least the last 15 years. It appears Learning Tree is only just waking up to this fact, if they have at all. It's a 'hybrid' model called Anywhere. Anywhere allows remote participants to attend a live Learning Tree class without having to be in the classroom – for up to 5 days... They have developed a portal to stream video and audio of the instructor's performance, with some real-time communication with instructor and other participants in 'break-out rooms'. I checked out the 3-day ITIL basic course. Apart from the limitations of needing to be roughly in the same time zone as the face-to-face attendees so I wasn't expected to sit up all night to participate, tuition fees are high. $2,390 is the standard fee for remote participants, in this case for the three day course. "Things that we are very being careful to measure at this point in time along with the response to our marketing are what happens in the way of cannibalization, are we seeing a response from people who would have come to the classroom but are now preferring to attend as remote attendees, because the remote attendees to carry a bit of incremental cost as well, so we have to measure all that and balance all that out and see what happens, but the effect that we'd be looking for in the short term would clearly be an improvement in the gross margin by increasing the number of attendees per event for those Anywhere titles." The major problem here, apart from the downside of having to pay a significant amount of money to stare at a screen for several days, is that instead of registering for the Learning Tree ITIL course and parting with $2,390, people preparing for the ITIL V3 Foundation Certification have a lot of other options. Many of them are free and most are certainly better approaches for learning than a solid 3-day away-from-job course. The Internet has not only changed the way we communicate but also our concept of 'freely available'. A cursory look at the ITIL resources available on the Net reveals a wealth of material on YouTube for a start. You've got the Principal Product Manager for EMC giving a 6-minute overview. If you want to get into a bit more detail there is lots of other YouTube instructional material. You can delve further into ITIL, maybe into Configuration Management, or access a number of other areas such as Service Level Management. Then there are numerous free books, guides and reports, such as the 230 page ITIL V3 Foundation Exam Study Guide, a comprehensive, freely downloadable book with "everything you need to know to pass the exam and in addition the official OGC sample exams included at the end of each chapter". Turning to collaborative and community support for learning, there's the ITIL Community Forum with its FAQs, feedback, forums and 23,000 registered users to interact with. I could go on. Now I may be missing something here, but think ILT training companies such as Learning Tree need to go back to the drawing board and make more fundamental changes to their business models for a number of reasons. Firstly, many CLOs in large corporations around the world now subscribe to the view that most organisational learning is informal and even where formal learning is used they expect more than a one-off event from their suppliers. The expectation is that the provider will make on-going support available through some form of online forum and email at least, or make their content available online in an on-demand way such as the excellent Books 24x7 has done. And CLOs want to integrate their provider's learning materials and learning tools with their own internal systems so that they can be made available across the corporation. CLOs are also looking to measure learning outputs rather than simply recording inputs. All-in-all they are becoming more savvy in their expectations and in the tools and approaches available to them. They want more than the 'same old ILT stuff' in their kitbags. Here's an example of what I mean by 'more savvy in their expectations'. When I was CLO at Reuters my learning and development colleague Andrew MacGovern developed the Reuters Institute of Technology which was a fully-featured set of online resources and tools to support our 5,000 or so technical and operations staff. Many of the technical staff were 'gen Yers' – the average age of the 1,800 software developers in Bangkok was 28 years and the 1,000 or so technical staff in Beijing were just a little older. The Institute didn't include any courses from suppliers such as Learning Tree, but was rich with resources from Books24x7, TechChek (a web-based technical skills assessment tool), internal company communities and knowledge sharing wikis. A ning site, podcasts, video learning resources, RSS feeds from the large technology providers such as Cisco, Sun and Microsoft, and a number of other facilities including a range short formal modules deep-linked from the corporate LMS that could be pulled on-demand. There were other integrated tools, such as the 'culture wizard' which matches the profile of one learner's country and culture to other colleagues to enable the development of more productive cross-cultural team working and support. It provided on-going learning and support opportunities. Andrew won the CLO Magazine's Gold Award for innovation in 2008 for this initiative. This is the type of provision many CLOs are either building or expecting to be made available to them. One-off courses will no longer 'cut the mustard' in the new world. Not even if they stretch their tentacles to remote participants. So what's the learning here? Well, I think that the learning is to always look forward and plan with an eye on changes and adapt your business model to suit the emerging world – whatever it may be at any point in time. If stalwarts such as Reader's Digest and Learning Tree can fall off the perch, other suppliers can as well. Last month Tony Karrer wrote an very insightful piece on his eLearning Technology blog about the Business of Learning. The post and the discussion underneath it are well worth reading. Tony equated the challenges of the learning industry to those of the publishing industry. Publishers have been going through a very tough time over the past few years. Even before the current economic turmoil, publishers were seeing their customers and advertising revenues bleed away to the multitude of new communication channels that has arrived as part of the tidal wave of Internet services. The business models that sustained publishers from the 18th to the early 21st century are no longer valid. The world has changed, and it will keep changing rather than returning to previous states. The old models that supported the growth of the publishing industry for more than 200 years are not going to sustain it again once the global economy has shaken off its current problems and returned to some form of stability. Publishing needs to look for new ways to sustain itself, new business models and new ways of publishing. It has no other option. The same applies to the Learning industry. In fact, I wonder whether we’ll even call it a ‘learning industry’ in a few years time. Jay Cross posted a comment under Tony’s article pointing out that a number of us in the TogetherLearn team have been discussing this issue and that we agree that ‘learning’ may have outlived its usefulness as a term. I don’t know what the ‘learning industry’ will be called in the future, but its focus will certainly be a lot wider than what is generally seen in today’s world as ‘learning and development’, let alone ‘training'. With this in mind we need to focus on new ways of learning to support our organisations’ new ways of working. This is where the data Tony Karrer presented is both interesting and revealing. 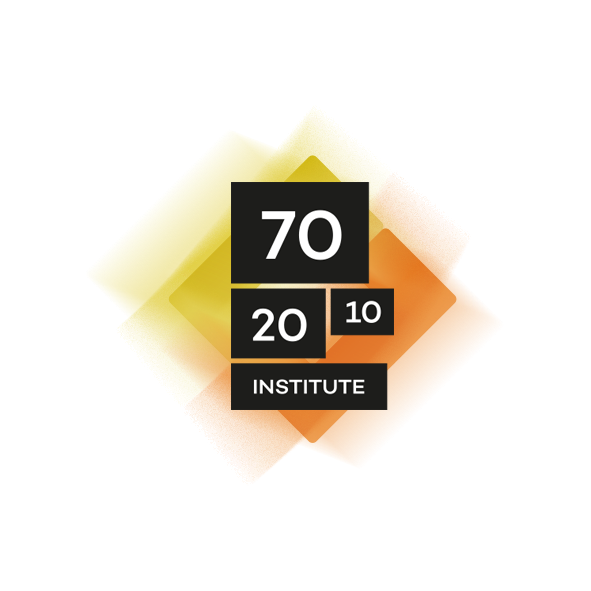 He references The Masie Barometer which provides a late-March 2009 snapshot of learning & development in a range of organisations – 77% of respondents based in the USA. It is useful to look at the Masie Learning Resources Barometer data alongside the UK CIPD data gathered a few months earlier. There are, unsurprisingly, plenty of similarities. When the CIPD asked the survey question “how would you describe the economic/funding circumstances facing your organisation in the past 12 months?” 85% of private sector organisations responded with either ‘decreased’ or ‘stayed the same’. When looking forward to 2009, the outlook was about the same – 86%. The Masie figure is 88%. The correlation between these two sets of data is high. Looking at the CIPD 2009 projections we get a slightly more optimistic view with between 10% and 19% of (mainly L&D) respondents suggesting that funding will increase. The 9% variation is across sectors – public, private and voluntary & community. Analysing these figures I think they support the fact that L&D people may be - underneath it all - optimistic types and maybe those that work in the voluntary and community sector are the most optimistic of us all. Either that or they just can’t bear to face reality ..
With these trends in mind it's hard not to agree with Tony Karrer when he says that the type of training we’d call ‘traditional’ is on an overall downward trend along with traditional publishing. And that it’s unlikely to return to the past status quo when the global economy picks up. The future business of Learning (or whatever name we finally settle on) lies in providing organisations with the tools, techniques and environments to support them in building employee capability and performance in an increasing range of areas. It certainly doesn’t lie in the provision of ' training'. Traditional training may have a role in the picture going forward, sometimes, but it will certainly be only a minor role. Which is why I’m not surprised with Tony identifying Learning Tree International as an example of training companies that are currently being hit hard – quarterly revenue from last year down from $47m to $30.5m and running at a loss. Learning Tree is a perfect example of a ‘traditional’ training company that has not altered its business model in light of a world changing around it. Although it now offers it’s AnyWare remote courses – allowing virtual attendance at classrooms in its education centres - which is probably marginally less useful than actually attending the face-to-face version (you don’t get the best bits - the coffee and lunch) the company has steadfastly refused to change its model to reflect the new world. I recall meeting with senior Learning Tree executives 5 years ago when I was chief learning officer at Reuters (an organisation that knows a little bit about the need to respond to changing circumstances and has done so pretty well over the past decade). The Learning Tree people told me at that time that they weren’t planning to introduce any ‘new’ approaches to their training provision. We could have their face-to-face courses or nothing. On the back of that information we chose to go our separate ways and Reuters teamed up with other training suppliers that offered blended solutions, virtual labs, online technical libraries, performance support/business process guidance and other more flexible approaches to building capability that were more closely built into employees daily workflow. The latter were a better fit for our learning strategy and offered far more value in terms of impact and ‘bang-for-buck’ than 3, 4 and 5-day stand-alone courses. What organisations need to look to achieve from their relationships with training/learning suppliers and from their own internal learning teams are new ways of doing things that work in 21st century contexts, in the same way that the publishers need to look at new ways of providing their services. This in turn means learning suppliers need to embrace new approaches and tools, new ways of helping individuals, managers and organisations to work better, smarter and faster and achieve more. This change will require CLOs and senior L&D executives to review how, and whether, they continue engagement with traditional training suppliers going forward. If they do, they will need to be absolutely sure that each supplier is providing real value. Some organisations have very rigorous mechanisms in place to manage their training/learning supplier base. But most don’t. However, if learning and development departments are going to operate efficiently and effectively, and provide real value to their organisation, they simply must do this. When I joined Reuters in 2001 I did something that hadn’t been done in the organisation before. I analysed the training supplier base in considerable detail – spreadsheets and spreadsheets of analysis. For a workforce of around 18,000 employees I discovered we had engaged with 3,025 separate suppliers of training or training-related services over the previous 18 months. That’s equivalent to one training supplier for every 6 employees! The thought that any ‘vendor relationship management’ could occur with this number of suppliers was laughable. I am sure that if you walked into many organisations today you would find the same situation. It’s crazy, but it happens more often than you think. However, this situation also presents great opportunities for consolidation and for reducing management overhead and costs associated with training and development, and also for controlling quality. If you're starting from here there are some potential big wins. When I presented the fact of the 3,025 suppliers to the chief operating officer at Reuters he was as incredulous as I was with the situation. He pointed out that the company had a single supplier for all PCs and laptops, one or two others for the company’s networking kit, and in other purchasing categories we had just a few carefully-selected suppliers. Yet we had more than 3,000 for our training. What was going on here? The COO said to me “OK. how many training suppliers should we have?” I really didn’t have an answer, but I knew it was certainly a lot less than 3,025 for our size of workforce despite the fact that we were spread across 92 countries. So I replied “let’s strike out the zero in the middle and I think we’ll be at about the correct level” – 325. So that's what I was targeted to achieve. Working with some very competent procurement/sourcing colleagues we created a simple approach for reviewing and rationalising our supplier base. Over time we reduced the supplier number to less than 500, a six-fold reduction from where we started out. Not quite 325, but close to it. This, in essence, is what was done. And that included supporting the move to the 70:20:10 approach we had adopted, an increase in learning provision underpinned by technology, and increased ‘informal’ learning support. 2. Preferred Suppliers – those that offered a number of best-in-class solutions that represented excellent value-for-money but could not, or did not, offer global solutions except by jumping on an aeroplane at the client's expense. 3. Approved Suppliers - those that met a defined level of service provision and value for money, but their services were limited and not strategically significant to the business. These suppliers were engaged with on a transactional ad-hoc or as required basis. 4. Non-Approved Suppliers – this was by far the largest category. After evaluation it was decided they didn’t fit into any of the other three categories. Most were small local suppliers offering non-specialist training that replicated the offerings of the strategic and preferred suppliers. Many had never previously been through a quality assessment. Following the vendor rationalisation process there were a small number of strategic suppliers, more preferred suppliers, a long ‘tail’ of approved suppliers and an even longer one of non-approved suppliers who were excluded from bidding for further work with the company. We then worked to consolidate as much of the work carried out by Approved Suppliers up to Preferred Suppliers and, in doing so, remove some of the ‘tail’ of approved suppliers. It was a long and tedious process that took several years, but it was largely successful, producing not just a reduced number of vendors, but greater alignment of the remaining vendors with our strategic direction. I think that every organisation could benefit from going through this process. UK politicians have been in the spotlight over the past few weeks with their creative use of the parliamentary allowance scheme. “Flipping” was one common way that some found to maximise their allowance income. This involved declaring one of their homes - either in their constituency or in London closer to the House of Commons - as their main residence, then claiming all manner of expenses against their second home. Then they’d “flip” and claim expenses on the other house. This was a really neat, if totally immoral and possibly illegal, way to spend taxpayers’ money. Now they’re being found out and punished. L&D departments have been '”flipping” for years. In some organisations they are moved from being embedded in HR to reporting into the business line and back again on a regular basis. Some also “flip” between local and global accountability as well. Most L&D “flipping” is an attempt to ensure a better workforce development service to the organisation. In fact, there’s no right answer – some L&D departments sit in HR and deliver a great service to the business lines, some don’t. Equally, some L&D departments sitting in the business do a great job and others don’t. There’s no structural silver bullet out there. The silver bullet, however, lies in two accountabilities. Firstly, L&D’s ability to be accountable for business results (or organisational results if you’re in a public sector or not-for-profit organisation). Secondly, there’s an equal need for L&D to be accountable for the efficiency and effectiveness of it’s services. If an L&D department is using sub-optimal approaches, flying ILT trainers around the world to deliver content-heavy classes for example, or is developing expensive media-rich eLearning programmes that only small numbers of employees need to use, it will likely be failing to deliver on these two requirements respectively. A strategic approach (from both top-down and bottom-up) is needed and get both business accountability and an efficient and effective L&D operation in place. The diagram below is an attempt to break out the high-level parts in these accountabilities. standardising;  globalising;  integrating;  aligning;  optimising. Focus on these will result in greater likelihood in L&D being able to deliver a service that brings value to the entire organisation. I spent most of my 8 years as CLO at Reuters involved in L&D transformation in one way or another. 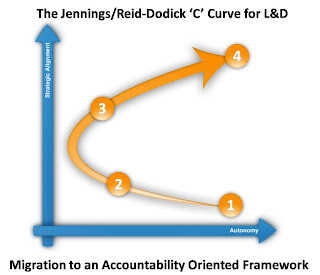 One tool I found very useful in planning a structure that would work for the organisation was the ‘C’ curve for an accountability-oriented L&D framework. The Global HR Director at Reuters and I developed this ‘C’ curve for L&D to help us make the initial changes. We used the ‘C’ curve model to define the journey needed to build an L&D function that was accountable for business results, whose operation was closely aligned with the company’s overall strategy, that embedded the ‘efficiency & effectiveness’ mantra but - at the same time - where the component parts of L&D could have some autonomy to operate and make decisions locally. This ultimately resulted in a federated organisational structure – a small core L&D team sitting in the corporate HR centre managing the overall strategy, alignment, standards, infrastructure etc. while the majority of L&D resources (and their budgets) sat in the various business lines delivering operational L&D services to their stakeholders. 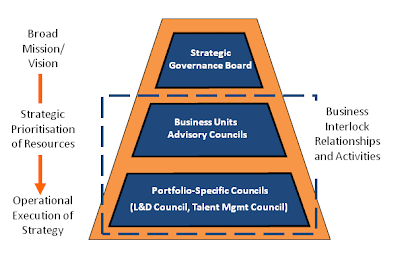 L&D was held together by a central governance board (mostly senior business managers, but chaired by the HR Director), and functional reporting lines for each of the Heads of Learning (every major business unit had one) into the CLO (my role). The ‘C’ curve below shows the steps that were taken to move to an accountability oriented structure that worked for us. 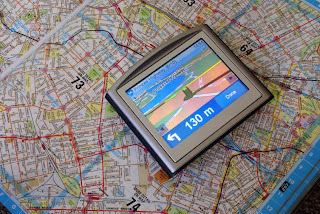 Ideally organisations want to move from , where pieces of the L&D puzzle are operating autonomously without being strategically aligned, to  where they still have a level of autonomy, but are strategically aligned. Many organisations are still living with  and don’t really know how to move away from having a gaggle of un-coordinated L&D/Training groups who are all doing their own ‘thing’ and often competing internally. The ‘C curve model is a mechanism for making that move. 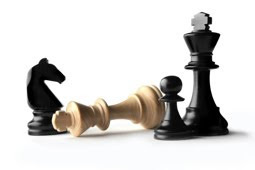 It’s highly unlikely that a 1->4 move is achievable without the intermediate  and  steps. That’s the way found it at Reuters. We first needed to bring all the L&D resources (or as many as we could put our arms around) into the corporate centre’s zone of influence – at  – and put the ‘twin pillars’ of standards and infrastructure in place. This meant removing the previous autonomy for the sake of alignment. Then we established a solid governance model . Only then could we return autonomy to the groups by restructuring as a federated service, creating the functional Heads of Learning role and moving most of the L&D people into the various business lines. The result was a structure that worked for the company. Operational L&D was aligned with the business. Business managers chose how to deploy their L&D resources, how to prioritise their L&D budgets etc. At the same time, corporate HR maintained overview of L&D and ensured that strategy, standards and infrastructure services were consistent across the organisation. As I said, there’s no structural silver bullet, but this model can be very useful as a means to get both alignment and accountability. Last month I was asked to give my thoughts on the UK Chartered Institute of Personnel Development (CIPD) 2009 Annual Learning & Development Survey. One thing became clear when I examined the CIPD data. It was that many L&D professionals (in the UK at least) seem to lack the innovation necessary to push the profession forward to become a leader rather than a follower. Of course there are exceptions but based on the data in the 2009 Survey L&D is simply not doing enough. The survey results suggests that the majority of time is still spent in designing and delivering instructor-led courses and curricula. This should be a real worry to everyone involved in the profession because that game’s well-and-truly up, and has been for some time. Training/L&D is a big business. In 2007 organisations in the US spent $134.39 billion (that’s right BILLION) on employee learning and development (reported in the 2008 ASTD ‘State of the Industry’ publication). Yet studies have shown that only a small % of this spend actually results in improved performance in the workplace – the Baldwin, Ford & Weissbein studies estimate that not more than 10% of spend transfers to the job. Yet if the CIPD data is to be believed, over the past 2 years (when the budget pressure has really been on) only 39% of UK organisations have introduced or extended the use of eLearning – for which I think we can read ‘technology-supported learning’ as a whole. And conversely, the time L&D staff spend ‘delivering courses/time in a training facility’ is still a staggering 46% – down just 3% from the previous year. An additional 46% of time is spent in the overall management/planning of L&D activities. This means that many Training/L&D staff only plan, develop and deliver ILT training and have no time to do anything else. Well, for a start, only 7% of the L&D Survey respondents thought that eLearning was one of the most effective practices, and only 27% viewed on-the-job training as the most effective L&D practice. So even L&D professionals haven’t done their research and reading. They are not champions of ‘new world’ approaches. There’s enough evidence now to show that Instructor-Led Training is not effective as an approach for the majority of employee development. ILT may be helpful for some change management and big-picture ‘concept’ development, but it is demonstrably the least effective and certainly the least efficient approach for most learning that’s required. The millions of $ / £ / € / ¥ spent on ILT for systems and process training, for instance, are 100% waste of time and money. This training is invariably content-heavy and people can’t retain what they’ve been taught for more than a few hours unless they have the chance to put it into practice in the workplace(which they invariably can’t as the training is carried out pre-rollout/pre-upgrade). We’d be better off giving our employees the money we spend for training them in classrooms on CRM and ERM systems and letting them go to the pub to spend it themselves – we’d all get better value through a more engaged and less stressed workforce. The CIPD’s summary of the 2009 Survey can be found HERE.